For years I saw them, long spotted necks and wide smiles beaming out from the mud and decay. Every structure I entered, under the shadow of every underpass, along every mile of track I walked, they were there. Each time I stepped past the hole in the fence I knew I would find one grinning at me, a mascot for each adventure: Girafa, the leaf eating, long-neck-for-life moniker of a local graffiti artist and explorer. The 50 mile Caltrain train ride from San Jose to San Francisco was a testament to the miles this artist traveled; with every structure along the peninsula rail system plastered with a menagerie of cheerful giraffes. The shadow cast by these long necks arched across the bay area, and in that shadow I stayed for years, knowing every space my lens led me to would be greeted with the familiar smile of another artist and explorer. Then in 2009, it all ended with a $100,000.00 warrant. Girafa was Steven Free, a San Francisco resident looking at 10 felony cases and $40,000 in damages. 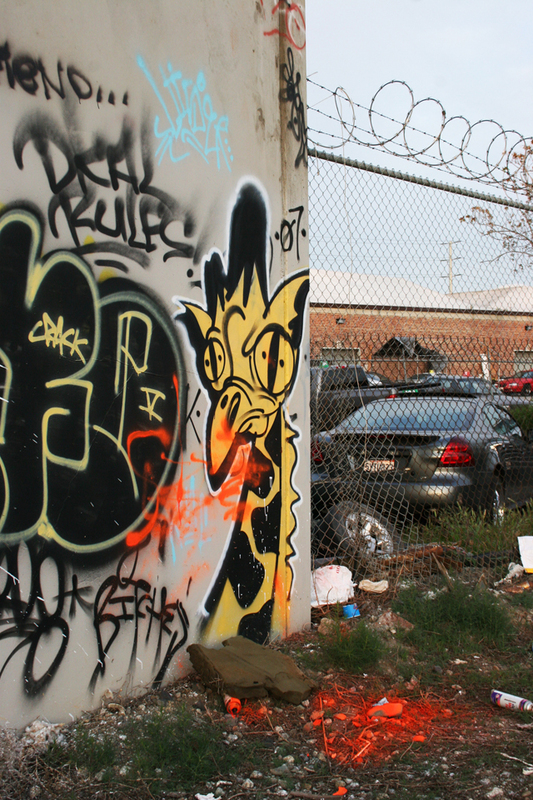 The police in 4 bay area counties were calling him the most prolific tagger in the bay area. The girafa was shot down and made an example for any would be graffiti writer, a warning to those who see the world as a canvas. In the time since Steven Free’s capture, and his eventual guilty plea, the pieces I photographed have been painted over by the cities, by the landlords or other artists fighting for their wall space and infamy. No longer is my wandering met with the memorable, radiant smile of an artist who saw the world as his jungle and canvas.